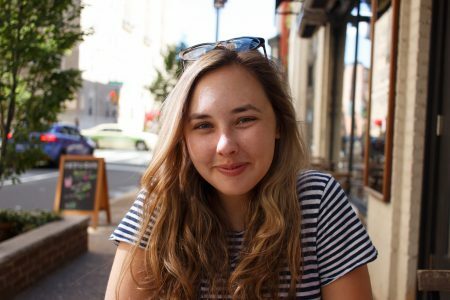 WASHINGTON- Caroline Jureller, a senior at American University, is showing women can run the world, and the workplace. Jureller is the co-president of Lean In at AU, which is a global club that promotes gender equality through small circle discussions. Jureller and a recent graduate brought it to AU during her sophomore year. They formed the group after reading the book “Lean In: Women, Work, and the Will to Lead” by Sheryl Sandberg. Since her sophomore year she has organized small groups called Lean In circles where women and men can talk about the gender issues they face at work and on a daily basis. Jureller said she became passionate about gender equality when she came to college and while interning felt the gender imbalance among her coworkers. Regarding career choices, “a lot of women take themselves out of the game before they’re even playing,” Jureller said. In the book Sandberg wrote about a woman who was scared to apply for a job because she feared it would interfere with marriage and children. The kick was, the woman wasn’t in a relationship yet and wasn’t a mother. The book is relatable for both men and women according to Jureller. “Women can’t succeed without the help of men,” said Jureller. She explained that women are often too afraid to speak up, then men become unaware of the challenges women face. Jureller described that gender equality also relies on the way women view themselves and their goals. She said that many women doubt their abilities. “I used to ask myself why” and after reading the book, “I started thinking why not,” Jureller said. To her, the most exciting part of being involved is the global reach that Lean In circles have established. After attending a Lean In conference in California, Jureller realized tens of thousands of women were attending these circles from the Middle East, to China to the U.S. military. Click to join or start a Lean In circle! Previous Post The Pope Graces D.C.